A: 5'-UTR of poliovirus RNA. B: 5'-UTR of encephalomyocarditis virus RNA. (Reproduced, with minor modifications, from E. Ehrenfeld, in "Translational Control", J. W. B. Hershey, M. B. Mathews & N. Sonenberg, eds., p.p. 549-573, CSHL Press, 1996, with permission). Figure 15.10. Model for internal initiation of translation on picornavirus IRESes. The IRES has a complex tertiary structure with a number of interacting stem-loops. This structure presents several sequence motifs, denoted by black bars, for interactions with the initiating ribosomal particle (40S subunit) and the associated initiation factors thus forming an internal ribosome entry site. The 3' section of IRES includes the oligopyrimidine tract and the unstructured spacer (see the text). The AUG triplet immediately follows the IRES. The AUG at the 3'-end of the IRES serves as the initiation codon in translation of the RNA of cardioviruses (e.g., encephalomyocarditis virus RNA). In the case of the RNAs of enteroviruses (e.g., poliovirus) and rhinoviruses, this AUG accepts the initiating ribosomal particle but is not used as an initiation site; instead, the ribosomal initiating complex seems to start scanning the downstream sequence until it encounters the next AUG that is to be the authentic initiation codon. 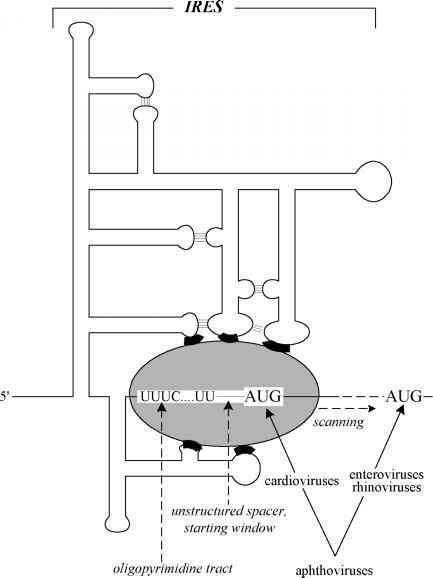 The aphthoviruses (e.g., foot-and-mouth decease virus) represent an intermediate case, with some of the internally entering ribosomes initiating translation at the AUG at the 3'-end of the IRES and some utilizing the next downstream AUG.
(Reproduced, with minor modifications, from R.J. Jackson, in "Translational Control", J.W.B. Hershey, M.B. Mathews & N. Sonenberg, eds., p.p. 71-112, CSHL Press, 1996, with permission). the function of the starting window but it must not be involved in stable secondary or tertiary structure interactions; pairing of the segment in a perfect double-stranded helix closes the window. In the cases of picornavirus RNAs the spacer between the IRES and the starting window usually includes a conserved polypyrimidine tract, with a sequence (UUUCC) complementary to the 3'-proximal polypurine sequence (GGAAC) of the 18S RNA of the 40S ribosomal subunit (Pilipenko et al., 1992). Thus, the AUG of the starting window is found at a defined distance of about 20 to 25 nucleotides downstream of the polypyrimidine tract (see Figs. 15.9 and 15.10). The situation resembles that with the Shine-Dalgarno sequence of Prokaryotes but in a "reversed" fashion: here pyrimidines of the pre-initiation sequence of mRNA may be paired with purines of the 3'-terminal section of ribosomal RNA. However, as already mentioned, this AUG is not necessarily serves as the initiation codon. 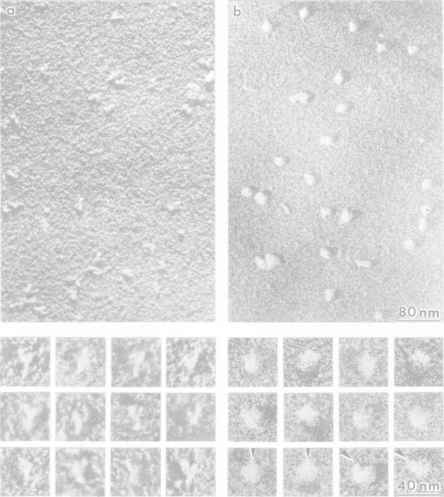 In the case of poliovirus RNA the ribosomal particles scan the sequence further and initiate at the second AUG downstream, whereas in the cardioviruses the entering ribosomal particles initiate translation at this AUG.
Other viral RNAs may also possess IRESes, but of quite different size and structure. The hepatitis C virus (HCV) RNA has an IRES of about 200 to 300 nucleotides long, located just before the initiation codon; it has nothing in common with the picornaviral IRESes. The IRESes recently discovered in some plant viral RNAs are even shorter, of about 150 nucleotides long (Ivanov et al., 1997). The IRESes of two above-mentioned cellular mRNAs (Antennapedia and BiP) are also smaller than the picornaviral IRESes. There is no obvious resemblance among all these IRESes in their primary and secondary structures. The pyrimidine-rich tract located 25 nucleotides upstream of the effective AUG typical of the picornaviral IRESes is absent from all other known IRESes. It seems that the IRESes of other virus RNAs and cellular mRNAs have their own specific three-dimensional structures different from each other and from those of picornavirus RNAs. It is not clear whether any complementary interactions between 18S ribosomal RNA and IRES sequences are involved in the association between the initiating 40S subunit and the IRESes of different types. The structural specificity of IRESes may be connected with the involvement of tissue-specific IRES-binding proteins required for the internal initiation. A special tRNA acylated by methionyl-tRNA synthetase serves as the initiator tRNA recognizing the initiation AUG codon (Smith & Marcker, 1970). The situation with Eukaryotes in this respect is similar to that of Prokaryotes. However, in contrast to prokaryotic initiator aminoacyl-tRNA, the methionyl-tRNA of Eukaryotes does not undergo formylation. Hence, the only difference between the initiator methionyl-tRNA and the elongator methionyl-tRNAMet lies in certain structural features of the tRNAi moiety itself. These features are what make the tRNAi capable of interacting with initiation factors (eIF2) and the vacant ("native") 40S ribosomal subunit, and incapable of binding to the elongation factor (eEF1A) and entering into the A site during elongation. The primary and secondary structures, in the cloverleaf form, of the two eukaryotic tRNA species are presented in Fig. 15.11. It can be seen that the differences are not that great. The most salient feature of the cytoplasmic initiator tRNAs of Eukaryotes is the unique presence of a "triple A": one A is in the D loop in position 20 (where it is very rare in other tRNAs), and two are in the T loop in positions 54 (instead of usual T in elongator tRNAs) and 60 (instead of a pyrimidine residue in elongator tRNAs). These three A's cluster together in the three-dimensional fold to form a hydrogen-bonded system not seen in elongator tRNAs (Basavappa & Sigler, 1991). The result is the strengthening of the interaction between the D and T loops. It is possible that the tighter contact in the region of the tRNA corner prevents some structural adjustments required for the binding at the A site of the ribosome during elongation. Like in the case of the prokaryotic initiator tRNA, three consecutive G:C pairs are present at the end of the anticodon stem. This structural feature is connected with a distortion of the typical conformation of the anticodon loop and stem, thus probably imparting a preferential interaction of the initiator tRNA with the P site, rather than with the A site of the ribosome.